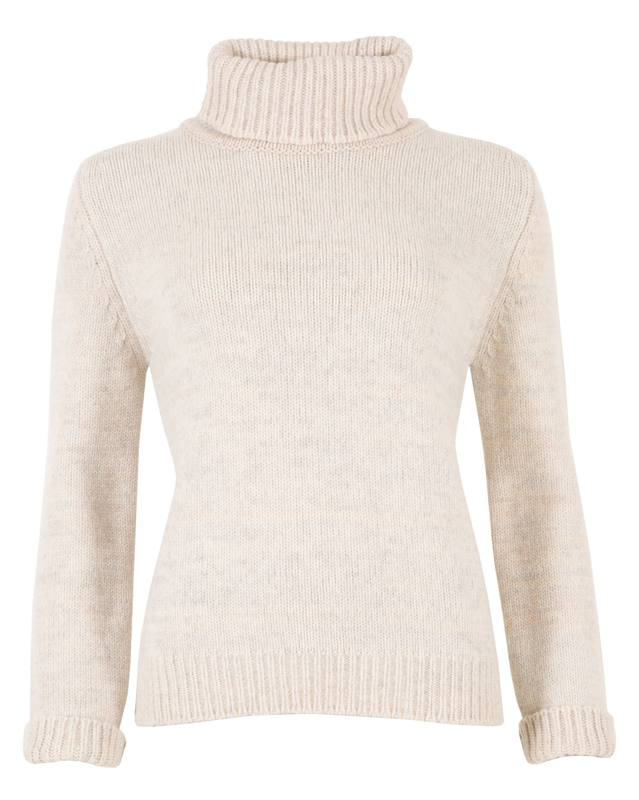 An easy-fitting knit with a cosy turtleneck and wide ribbed trims. Our Turtleneck Slouch is made in Britain from extra-fine baby merino, so it’s soft and warm but surprisingly lightweight. We love it worn with jeans for relaxed chilly weekends. 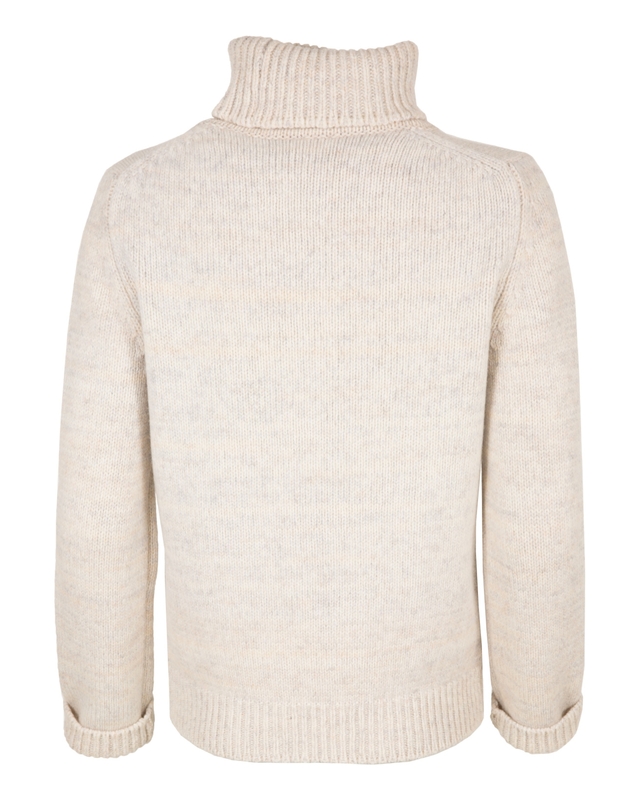 Made with 100% Merino Lambswool -Merino wool has superfine, silky fibres which help regulate your temperature. The fibre’s natural elasticity means they stretch for a great fit and then return to their natural shape. Beautiful and warm jumper. I am petite 152cm/100 lbs and to my surprise this one(size S) is perfect/length and width wise. As other reviewer mentioned,color is more like blue ish and marl blend. Roll neck very 'soft' not too tight. Bear in mind that this sweater is quite short(long enough for me).I would recommended to a friend. Thank you Celtic for shorter version of your lovely knitwear. This is a lovely sweater, very well made and heavy enough for those really cold days and nights. I am usually between sizes- small to medium, size 6 or 8 depending on how it’s cut (i’m 5’-5”, 130 lbs.). I ordered a small, it fit well but I was nervous it would shrink with washing so I ordered a medium. I ordered the ecru marl color, it is definitely darker than it appears on the model, more of a color you’d expect from natural undyed wool. I wound up keeping the medium. The roll neck is somewhat confining, so beware if you are sensitive to that (I am fine with it). The only complaint is the return process from the US, I spoke to 3 different customer service reps., none of whom knew what to do with the paperwork you download online. I took it to USPS yesterday and am crossing my fingers it is received back in the UK! Thank you for your feedback, we're so pleased you love the sweater! We will be sure to look into who you spoke with regarding the returns paperwork, looking at the calls it seems you got through to our our of hours team. We will be sure to speak with them and make sure they are up to date on our services. Simple design, very classy, and great for warding off the winter chill. I've just bought the charcoal marl, which looks great, goes with everything, fits perfectly (size small), and is already indispensible in the cold weather. Great to wear a BRITSH made garment as well! Only slight quibble for me is that I find the wool slightly itchy, especially the high neck, but it's not a problem as I can wear a lightweight long-sleeved polo-neck top underneath. The length is fine - some people have found it a little too short, but there's quite a lot of give in the wool, and you can pull it down a bit by hand. I think the length complements the classic design of the sweater anyway. A very useful purchase - not cheap, but worth it! Another smashing success of a sweater! I hesitantly ordered a S (always am XS) because it wasn't available in XS. Turns out it fits beautifully and is now probably the warmest sweater I own. A bit more length would be wonderful (perhaps in the future?) but I am very pleased with it.....as I am with all Celtic and Co products. You rock!